We’re back with a bunch of stock wallpapers from a Xiaomi Redmi device. In this post, we will talk about the Redmi Note 7 device overview and will provide link to download Xiaomi Redmi Note 7 Stock Wallpapers on your phone. These stock wallpapers are in high-resolution quality (1080×2280 pixels). The official Redmi Note 7 device display looks so beautiful and vivid in terms of 19:9 aspect ratio or bigger screen size. Let’s go through an overview of the handset. 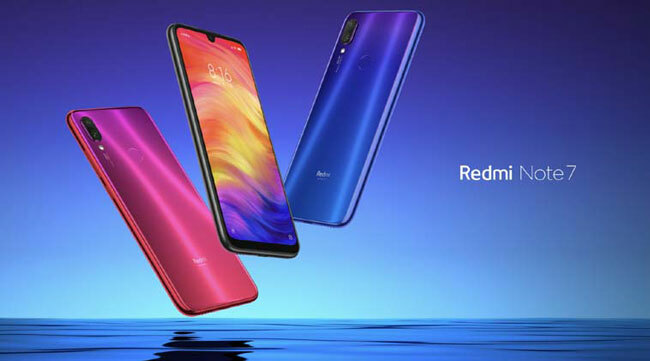 The Xiaomi Redmi Note 7 comes with a 6.3-inch Full-HD+ LTPS display with a 19.5:9 aspect ratio, 1080×2340 pixels resolution, the 2.5D curved Corning Gorilla Glass 5 protection. It’s powered by the 2.2 GHz octa-core Snapdragon 660 AIE SoC coupled with Adreno 512 GPU, 3 GB/4GB/6GB of RAM variants. The device does have a 32 GB/64 GB of internal storage option with up to 256 GB of microSD card expandability. In terms of the connectivity options, it includes USB Type-C port, a 3.5mm headphone jack, 4G dual VoLTE, GPS, A-GPS, GLONASS, Bluetooth V5.0, and Wi-Fi 802.11a/b/g/n/ac. The Xiaomi Redmi Note 7 measures at 159.21 x 75.21 x 8.1 mm and weighs 186 grams. According to the sensors, it includes the Gyro, Accelerometer, Distance sensor, Electronic Compass, rear-mounted Fingerprint sensor, Ambient Light sensor, Vibration Motor, and an IR blaster. The device price starts at CNY 999 in China which is around Rs. 11,000 INR (approx). While the other two variants will cost around Rs. 13,000 INR (approx) and Rs. 15,000 INR (approx) in India. Now coming to the main topic, here is the Redmi Note 7 Stock Wallpapers zip file download link given below. Just download the file on your device and extract it. Then go to the extracted folder and choose the wallpaper to set on your homescreen or lockscreen. Meanwhile, you can also access the extracted images from your phone gallery as well. There are total 07 high-quality wallpapers available in 640×1351 pixels resolution format. These wallpapers will fit perfectly on your 18:9 or higher aspect ratio devices.